sport together has presented an exciting new opportunity for Show. It is the inevitability of the event world: stage gets bigger and flashier. As the necessity to stay fresh and innovative mounts in the industry, RK in the cases are using new materials and strategies to keep costs low and attract more attention. Concert stage with adjustable height is Closer to the customer's sight and enhance customer vision feeling. 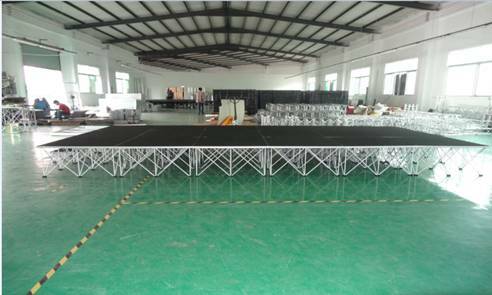 Aluminum stage is widely used to African market ,and Our smart stage is the most popular in USA.Recently our smart stage have a big promotion before 1th MAY, please click it to know more.